Universal CityWalk is a dining, shopping, and entertainment district that serves as the entrance to Universal Orlando Resort. Opened in 1999, the vibrant area attracts both theme park visitors and locals who are looking for top-notch restaurants, live music, unique entertainment, and exciting retail stores. Dare To Live In Full Color! Blue Man Group will rock your world and blow your mind. Experience a spectacular journey bursting with music, laughter, and surprises. Every fall at Universal Studios Florida™ nightmares rule the darkness. Haunted houses drawn from the greatest horror stories chill the bravest souls. Streets transform into sinister scare zones. Mad laughter echoes from outrageous live shows. Head upstairs for intimate dining tables overlooking the main floor, or soak up the starlight on the outdoor patio for an unrivaled view of Universal CityWalk's shimmering lights. Here's your chance to be in the band! At CityWalk's Rising Star karaoke club, you take center stage as the lead singer of a band. This is real music, played live while you belt out your favorite songs in front of a live audience! Escape to Margaritaville, right in the middle of Universal CityWalk™ at Universal Orlando Resort™. A boat-filled marina in a tropical location is the scene that transports your event to the exotic destination of their dreams. Extraordinary foodstuffs abound at this new full-service restaurant, bar and confectionary. Indulge in classic dishes like steak and seafood, as well as an all-day brunch menu featuring crepes and quiches, each with their own novel twist. Bustling, family-friendly fusion eatery at Universal CityWalk with burgers, sushi & a full bar. This cash-only, counter-serve bakeshop serves creative donuts in colorful, quirky environs. Large, modern sports bar in Universal Orlando Resort with foosball tables, a pub menu & patio seats. Colorful canteen with modern & traditional menu offers sushi & other Japanese standards, open late. Replica of a famed Louisiana bar, with Cajun eats, drinks, dueling pianos & a "flaming fountain." Decorated with rock music memorabilia, this modern, upscale hotel is a 5-minute walk from Universal Orlando and 2.4 miles from Orlando International Premium Outlets. The resort hotel is a 17-story tower housing 600 rooms, and is advertised to be sleek, stylish, and modern. This upscale Italian-themed hotel is 2.9 miles from The Mall At Millenia, and 3.2 miles from shopping and dining on International Drive. 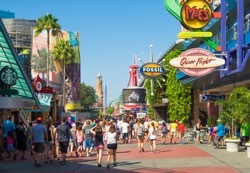 Visitors will want to be sure they don’t miss these top tourism attractions in Universal CityWalk. 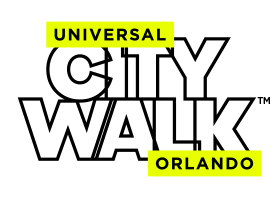 Nearby attractions offer visitors a great day trip from Universal CityWalk. Try one (or all) of these great Universal CityWalk restaurants for a tasty dining experience. The Cowfish Sushi Burger Bar – Bustling, family-friendly fusion eatery at Universal CityWalk with burgers, sushi & a full bar. Bubba Gump Shrimp Co. – Family-friendly chain for seafood & American fare served in a fishing-boat-themed setting. Voodoo Doughnut – This cash-only, counter-serve bakeshop serves creative donuts in colorful, quirky environs. NBC Sports Grill & Brew – Large, modern sports bar in Universal Orlando Resort with foosball tables, a pub menu & patio seats. Fusion Bistro Sushi & Sake Bar – Colorful canteen with modern & traditional menu offers sushi & other Japanese standards, open late. Pat O' Brien's – Replica of a famed Louisiana bar, with Cajun eats, drinks, dueling pianos & a "flaming fountain." From casual comfort to luxury accommodations, Universal CityWalk has plenty of great hotel choices for you to relax and unwind. Hard Rock Hotel – Decorated with rock music memorabilia, this modern, upscale hotel is a 5-minute walk from Universal Orlando and 2.4 miles from Orlando International Premium Outlets. Aventura Hotel – The resort hotel is a 17-story tower housing 600 rooms, and is advertised to be sleek, stylish, and modern. Portofino Bay Hotel – This upscale Italian-themed hotel is 2.9 miles from The Mall At Millenia, and 3.2 miles from shopping and dining on International Drive. Universal Orlando CityWalk offers up an amazing array of enticing shops, the hottest clubs & thrilling venues. It is the to-go destination for concerts, live entertainment, and even a movie theater. 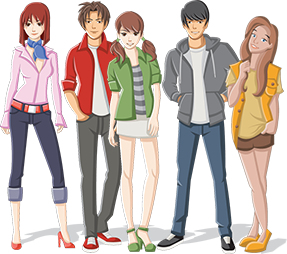 For a night out or to continue the fun after a day at the theme parks, you will find everything you're looking for here.